a) the text of the article (or page, or product description) needs to be 100% Optimized with the SEO Live Assistant, following all those criteria. b) the info in the Snippet needs to be 100% Optimized with the Assistant inside the Bulk SEO Settings section of Squirrly. They are two different elements. They contribute the most to having perfect SEO pages, even though, as you can see in Focus Pages you also need Platform SEO, Platform Health, Traffic Health, etc. because Google kept evolving into what it is today. Back in 2012 and 2013 if you had just a 100% optimized text, you had yourself a perfect SEO article. We know this because we were the first to offer this and to make it all in real-time, with as-you-type advice. However, things have changed a lot since then. That’s why today, you need to create a Snippet for your Focus Page and have that Snippet turned to Green. You can think of the whole content as having: text and media (a) and packaging (b). Everything in (b), the Snippet, helps search engines and social media sites learn what the page is about, how to interact with and how the page is supposed to be displayed. That’s why we usually refer to it as packaging. Go to WordPress – Squirrly – SEO Settings. The panel that opens is Bulk SEO Settings. Check out the 4 main elements: METAs, Open Graph, Twitter Card, Visibility. Turn all 4 elements for your Focus Page to Green. Sometimes, you will have elements with a blue (turquoise, actually) color. Those are the things made by our Automation features. However, because the focus page is one of the most important pages on your site, you need to customize the settings. That’s what will turn those elements to Green. You just need to click on each element and read the tasks from the sidebar. Remember to click on them to open up the pop-up which tells you everything you need to know to turn it from Red to Green. See what you need to do. Remember: you can always ask people from the JourneyTeam to help you out if you get stuck or if you have questions. Know, that if you want maximum performance, you will need to have your META keywords settings activated. Even though Google doesn’t really take them into account, they’re still needed for other search engines, for Squirrly SEO and sometimes even for results that Google displays (but I don’t want to get into this, because of too many naysayers). Ignore any so-called experts who say that META Keywords are bad for SEO. Such things are completely wrong. They are just typical fearmongers, making money by scaring people. Okay, these being said, turn all those elements to Green. 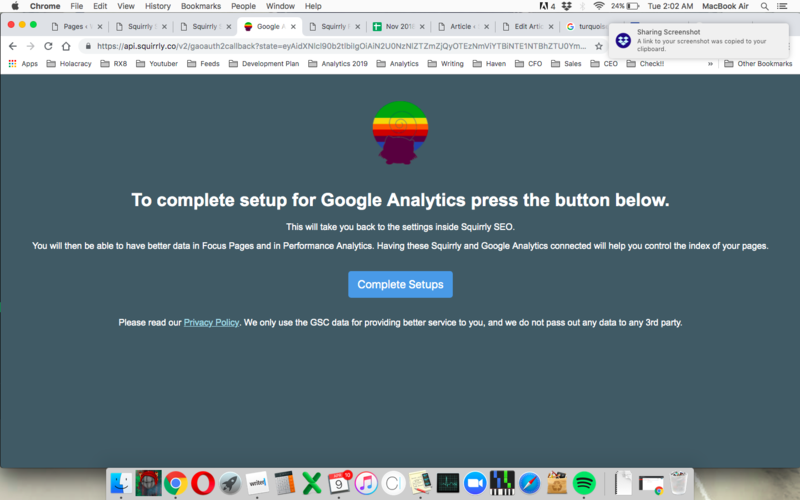 Create a Google Analytics account if you don’t already have one. WordPress – Squirrly SEO – SEO Settings – Tracking Tools : here is where you place your tracking code. It will help you verify your site in Google Analytics and it will help you receive data afterwards from the site. Once your site is verified and ready in Google Analytics you need to integrate your analytics with our Squirrly SEO Platform, so that Focus Pages can read the data to provide you with the valuable info inside a couple of Focus Pages sections. a) Click on Sign in. c) New panel shows up there asking for permissions. Click Allow. e) Hit refresh in your browser. All done! You’ll soon get Analytics data inside the SEO Audit, inside Focus Pages (Traffic Health and Reader’s Experience). Google relies a lot on your Analytics data to figure out if people really like the content on your site. If they find it valuable. Of course, there are methods for Google to estimate the time that people spend on your pages, using other means… however, if you directly give them the correct readings, it will be easier for them to process your data. They will get more accurate readings from your site. Things will be better for your rankings. ^^ you’ll see the easy way to fix the readings in that link. If you don’t get the right readings for your Focus Pages, you won’t really be very successful and your rankings won’t live up to their potential. The fix is a super fast, super lightweight plugin that’s NOT developed by anyone related to Squirrly. However, we’ve been using it successfully since 2016 on many squirrly and non-squirrly related websites. The time on page readings we get are the same ones we get from Hotjar. So it’s easy to verify that it works well. You don’t need to have thousands of followers. You need to follow proven methods for doing social media sharing. I know this is out of your comfort zone.. for many of you. However, we have a couple of lessons you can skim through. Even just by skimming through them you’ll learn what you cans tart doing today. You need external signals and Authority for your site and your Focus Pages if you want to get really good rankings. There’s really no skipping this if you want performance. For one of our clients, we ranked his site just with having long-form content (2,500 words each article) and doing social media sharing. That’s it. Once you have a great method for sharing content from your site and you learn how NOT to abuse social media sites (Don’t Ever Abuse People’s Attention!!! ), you’ll be well on your way to Better Ranking for your focus page. You don’t always need traffic from the social media sites. Just getting social signals back to your site is enough for Google. The logic behind this is: if nobody shares your site on social media, then your site is not important. That’s how Google’s algorithm “sees” this. Find the proven methods in Education Cloud. It’s the Premiere education platform of Squirrly. There are 6 Modules available to you (for free!). You’ll find the lessons here after you get your account. Read and start sharing TODAY. Then make sure you keep sharing every day to different communities, groups (where it makes sense! Only where it makes sense and with a message that makes sense for people in that group! Otherwise, you could find admins like myself who are brutal moderators! ), quora, twitter, facebook, linkedin, pinterest, etc. Don’t forget using Pinterest Boards (it’s Pinterest’s super-power). Force a new re-index using the Search Console integration from the Focus Pages section. After any important change you should manually ask Google to re-index. Otherwise it can take Google up to 5 months to come back and re-index the details of your page. Which means your hard work will go un-noticed if you don’t do this.